The Makers Market and Workshops - Summer Fun Passport Series - A Great Deal all Summer Long! Home / Products / Summer Fun Passport Series - A Great Deal all Summer Long! Summer Fun Passport Series - A Great Deal all Summer Long! Get Ready for an Incredible Summer! Summer Fun Passport! Summer 2019 ~ Summer Family Fun ~ 1 Incredible Price! Escape the heat and the house this summer and come to The Makers Market! Create memories and get creative with your kiddos. 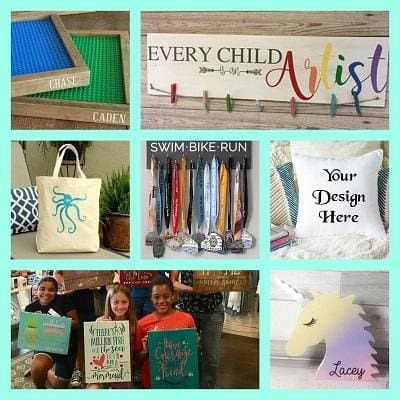 Typically projects Range in Price from $25 to $35 each!! One 10 project passport can save you over $200! That's a Significant Savings! Child participation does not require the purchase of an adult passport add-on (or project), however we do require an adult to be present with children at all times. Once you have purchased your passport, you will receive an email with your special code that you will use when you register for your classes. Passports are non-transferrable. One individual passport must be purchased per guest. Only the (person) name assigned to the passport may use it. Passports must be used in completion by August 11th, 2019. Credits or refunds will not be given for passport projects not used. Preregistration through our Summer Fun or Family Fun Class link is required in order to attend a class. This special offer may not be combined with any other offer or discount.